Pirl network has a problem. The network has been split in more than 5 chains. We are waiting for Pirl devs to solve the issue. Our pools may be temporarily offline for the resynchronization purpose. Please mine on your own risk only. Ellaism (ELLA) and Yocoin (YOC) delisting from 2Miners. The pools will stop receiving shares on April, 25th at 05:00 UTC. Please switch your mining rigs to other coins. Ravencoin (RVN) mining pools are Online. PPLNS, SOLO. Please check the Help section before you start. We are increasing the share difficulty at BTCZ and ZEL PPLNS Pools from 512 to 1024 to match the latest Nicehash requirements. This will not affect the miners reward. What is share difficulty? Data center in Europe, Asia, US: real dedicated servers and DDOS protection. 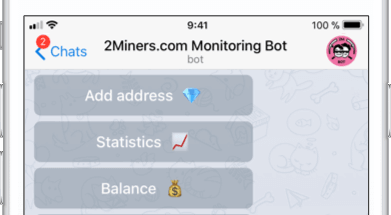 @Pool2MinersBot — rig monitoring: ofline obaveštenja o stanju rigova.